I appeal and invoke from the bottom of my heart, please be near. Your lotus-sun cushion flattens all obstacles and evils. While there is meditation, you are requested to firmly remain. The great offerings whose nature is bliss-void and wisdom. Please accept them, with the ultimate bliss-void attitude. I purify in the nature of void all actions which oppose your thoughts. And the infinite Amrita, the nectar offering, filling up all universes. By your power, please accept and enjoy. I praise you, who appear terrifically though inseparable from these three. Spread the infinite activity of the impeccable virtuous system. Prosper spiritually and materially while remaining in good health. May all those who even briefly interact become worthwhile. From the bottom of my heart I single-pointedly address you. Please remain inseparably with me and my circle as our Defender, Protector, Supporter and Friend without interruption. I contemplate, I call upon you, please pay attention. This prayer was composed at the request of many Dharma friends, especially my long-time associate, Geshe Tsewang Thondup, who gave a scarf and other gifts. As far as I am concerned, there are clear signs which indicate this great protector has been safeguarding me for many lives. At this time especially there is a strong need for a prayer to the great Setrabchen, and remembering his kindness, I, Ngawang Gelek, composed it spontaneously before dawn on the second of October, 1981, at my own place, Garden of Great Bliss. Translation into English was completed during July of 1989 while on a teaching tour of Malaysia. At this time, the section referring to Jewel Heart was composed and inserted in both the English and Tibetan prayers. This entry was posted on Friday, March 12th, 2010 at 6:08 pm	and is filed under Dharma Readings. You can follow any responses to this entry through the RSS 2.0 feed. You can leave a response, or trackback from your own site. Incredibly moving and swept me away, to be so humble and yet share a Sonnet that speaks from his heart to me here today! Thank you for publishing this great prayer and having it in English version as well. It will help me greatly to understand better before I chant it in Tibetan. It’s never been easy for me to understand as most scripture are in Tibetan… Thank you for making the English available and I’m sure the a lot of people out there will appreciate the above prayer. Setrap Chen is indeed the leader of great bliss. He fills with bliss all those whom he loves. 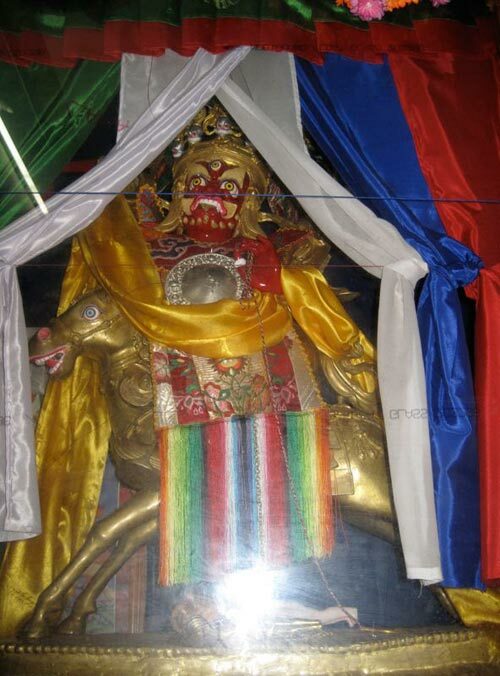 A beautiful prayer to recite and be connected to this great protector deity.